Does your long desired sleep get interrupted every night due to heat and sweatiness? Then, you need the perfect product to get you the perfect amount and quantity of sleep every night. The 21st Century modern lifestyle can get stressful and tiring for you with a hectic schedule full of family and professional responsibilities for you to fulfill 24/7. This is why you need to maintain good health and keep yourself pumped up with maximum energy all the time. Skipping even one day due to poor health can set you back in the race of life. It can also prove to be a huge drawback for the progress of your loved ones. This makes sleep an essential aspect of your daily life. So, what do you need to consider the most in order to ensure a good night’s sleep? The answer, according to the Sleep Medicine Division of the Harvard Medical School and WGBH Educational Foundation, is your sleeping environment. This means that the environment within your bedroom where you sleep can affect your sleeping quality and quantity. Two of the important factors to consider within your sleeping environment are the temperature of your surrounding and the comfort level of your pillows. After conducting research, the Sleep Medicine Division came to the conclusion that an ideal temperature for most people to sleep in range from 60°F to 75°F. Therefore, a cool atmosphere generally ensures good, restful sleep. The REM stage of the sleep must be achieved regularly to ensure a good night’s sleep. Extremely warm temperatures have a tendency to disrupt sleep, particularly interrupting the most necessary REM sleeping stage. This is because the Sleep Medicine Division had discovered that REM is the most sensitive to unsuitable temperatures. You will need to evaluate whether the cooling gel pillow you are going to buy actually is going to perform its intended function – that is keeping you cool all night. You will want the pillow to be soft in texture and comfortable to sleep on. You might prefer to have adjustable cooling gel pillows that will conform to the shape of your head. Furthermore, you might want exclusively designed cooling gel pillows if you have trouble sleeping due to neck pain. You will find orthopedic contour cooling gel pillows to serve such purpose. Moreover, if you suffer from allergies, you must check to see if the materials within the cooling gel pillow are hypoallergenic or not. 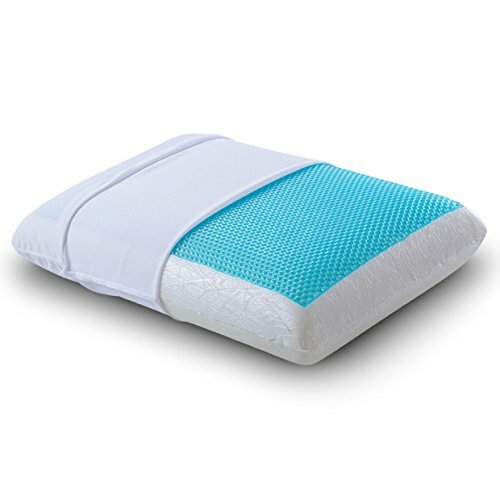 Based on the various characteristics included or excluded, you should choose the brand of cooling gel pillow that will provide the most value for your money. To help you out in your decision, here are 5 of the best cooling gel pillows available in the current market. The cooling gel pillows are one of the best-selling cooling gel pillows available in the current market. Apart from keeping you cool for a restful night’s sleep, the cooling gel pillow also fulfills additional purposes to further ensure your proper sleep. 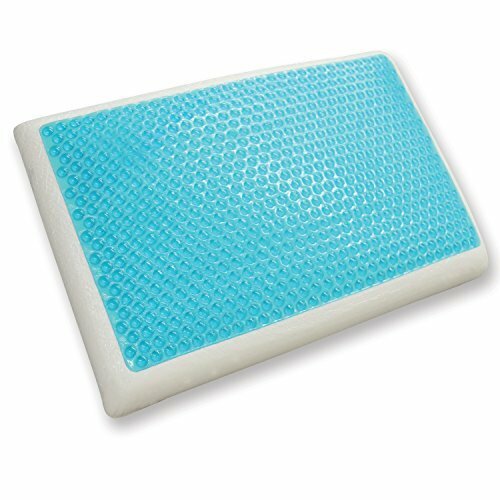 Cooling Gel Pillows are one of the most popular products within its product category. This is because the product successfully supports a good quality of sleep to its users with its innovative design and features. 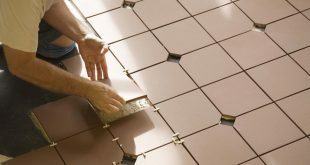 This product comprises of a gel pad that is highly heat resistant and maintains a low temperature with the implementation of its thermo-regulating gel technology. This cooling technology works as the heat gets equally distributed over the cooling gel pad. This diffusion of the heat allows high temperature to be lowered. You will find that your pillow is customized to keep you both cool and cozy. In the hot temperatures, the cooling technology on one of its sides will keep you cool while the other side is designed with plush memory foam to retain heat for a chilly and cozy night’s sleep. Additionally, the soft textured memory foam is orthopedically designed to provide professional support for your joints and spinal alignment. This should be most preferred by those with joint aches in the neck, head, spine and other pressure points within the body. Also utilized hypoallergenic materials in the manufacturing of this product so that it is free from all environmental allergens. Cooling Gel Pillows are highly praised within the market. More than 50% of its users in the market including some of my colleagues as well as myself have all concluded that this product is worth being mentioned as one of the best cooling gel pillows. We believe that the product’s cooling function technology truly lives up to its name. We were glad about not waking up with damp hair in the morning which means that this product ideally prevented sweat throughout the night. What’s more is that it completely helped relieve joint pain with its orthopedic memory foam. We were delighted to find that the fillings inside the pillow did not require regular manual adjustments but automatically adjusted to the shape of our heads and to our individual sleeping positions. One of our colleagues who had radiating nerve ache from a dislocated disc within the neck mentioned that the pain disappeared a few days after the use of the product began. Those who slept in the side-sleeping position and the stomach-sleeping position felt the most comfort with this product. There were slight complaints about a repulsive odor that was smelled initially and after a few days of usage. However, after following the company’s maintenance tips, we found that there were not any significant bad odor remaining. The company recommends its users to air the pillow out for 2-3 days in an area with open ventilation. We can confirm that this technique works and it does not take more than 3 days to come into effect. Equinox Cooling Gel Pillows have a range of attractive features that make them the most valued products available at the most affordable price in comparison to all the other products within this category. You can remain assured that you will enjoy the perfect sleep within the most comfortable environment when you use this product. You will enjoy a cool, freshening sensation because of the Honeycomb cooling gel technology. 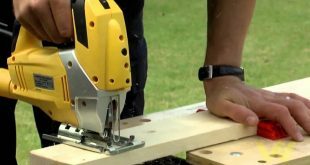 The implementation of this technology allows constant airflow to exchange frequent heat from the body to the surrounding air, keeping the air cool as the heat is extracted from the body. The ‘CertiPur’ memory foam technology is designed to provide therapeutic treatment to counter head and neck pain. The foam is set to complement you as you rest upon it while largely supporting your neck and head. These pillows are maintenance-friendly as they are compatible to both machine-washing and mild hand-washing. Moreover, the pillows do not need to be adjusted as they always maintain their original shape and fluffiness. Equinox Cooling Gel Pillows are recommended by its users for year round usage. More than half of the users within the market as well as my colleagues and I believe that these pillows deserve to be rated as one of the most excellent cooling gel pillows available. Almost all of us have noticed a significant improvement in our quality of sleep with the product’s superior comfort level delivery. 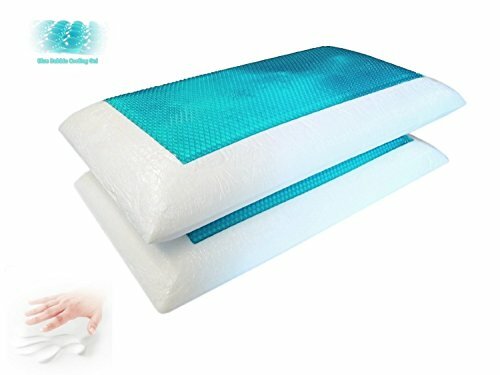 During the hot summer days, we found extreme pleasure in sleeping with these cooling gel pillows for long uninterrupted hours. We also recognized that the pillows are quite durable since they retain their original shape and structure for extensive periods. We were thrilled with the reasonable price and felt that the pillow was truly a bargain for the values it had provided. Perfect Cloud Cooling Gel Pillows are preferred by a large portion of customers within the market because of their useful features. These amazing features serve several other functionalities along with their main function. These pillows deliver dual cooling effects during sleep along with the option for you to choose from either the cooler side or the contouring side. The cooler side consists of smart gel layered technology and the other side with lesser cooling effect comprises of the company’s signature memory foam layered technology. The pillows contain ventilation holes that allow intensified flow of air for easy exchange of warm air with cool air, making sure that the pillow remains cool. 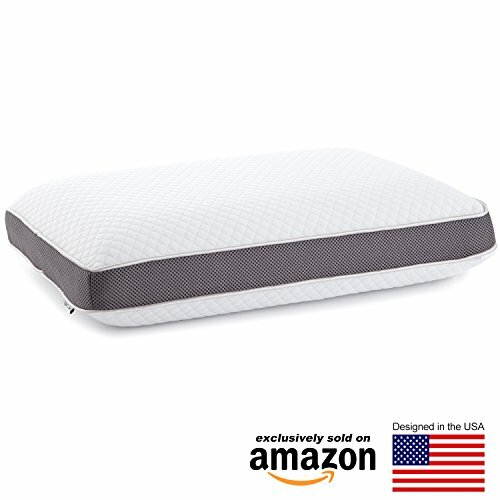 The memory foam will self-adjust to the movement of your head and neck, thus providing strong support. The memory foam also helps in spinal alignment while reducing pressure on the sensitive joints of your body. This product provides a luxurious sleeping experience due to the carefully devised signature designs implemented and the premium materials used. Perfect Cloud Cooling Gel Pillows are preferred by my colleagues and me along with most customers within the market for providing the most lavishly comforting sleep that we have never experienced before. We strongly recommend the product for being one of the most comfortable cooling gel pillows available. We were impressed that our sleeping experiences were far better than we had imagined at first when we first took a good look of the product and its features. Few of my colleagues even termed these pillows to be “cooler” than their spouses! Another colleague of mine who had been suffering from neck pain ever since a neck surgery was conducted, testified with relief that the pain had decreased largely. There were very few of us who had reported having any bad experience with using this product. Some of my colleagues who had some trouble with the product explained that the pillow became well-adjusted after a few days of usage. They suggested that the pillow should be used for at least 3-4 days before it can truly conform to one’s sleeping position and support the user entirely in order for the user to experience the most comfortable state of sleep. We recommend these pillows to side sleepers particularly. The cooling gel pillows from Classic Brands provide the perfect combination of coolness and comfort while sleeping. 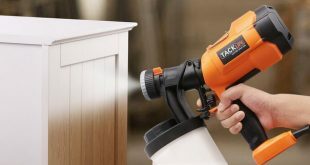 Some of the unique and convenient features of this product make it one of the best products available for purchase within its product category. Classic Brands Cooling Gel Pillows are renowned for the perfect combination of cooling gel performance and their high standard memory foam. You will enjoy a sound sleep experience due to the constant cooling effect. This cooling effect is released from the cool gel and the memory foam. The cool gel functions in synchronization with the memory foam by dispersing the body heat and working jointly together to dissipate the heat therefore, bringing about a pleasant cooling sensation as you sleep. The memory foam is temperature sensitive and promotes increased flow of cool air with its open-cell technology. 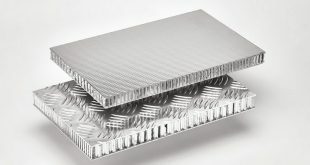 This open-cell technology makes the foam highly porous and each of its units are distributed over a larger area, thus promoting swift and easy transfer of air. Therefore, you will not have to flip the pillow to find the most cooling region. Furthermore, you will find the memory foam to be pressure sensitive which means that the foam works well in accommodating the natural curves of your head, neck and shoulders. 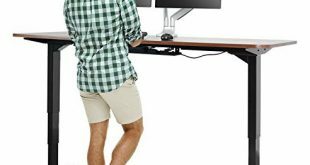 These features are ideal for side, stomach and back sleepers. The memory foam side is designed to be medium-soft in texture while the cool gel side is designed to be medium-firm in texture. Classic Brands Cooling Gel Pillows are considered as one of the best cooling gel pillows in the market by a majority of its users that include some of my colleagues and me. 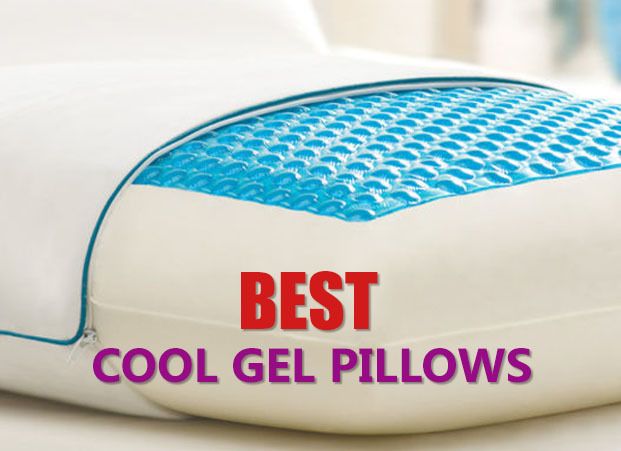 Therefore, we believe that the product should rightfully be included in our list of the best cooling gel pillows. We mostly appreciated the pillow’s delivery of comfort over its cooling effect. Some of my colleagues have reported that using this product had helped them to enjoy long uninterrupted sleeping sessions however, they had not experienced a great deal of cooling sensation as they had hoped for initially. Regardless of this, they felt more supported by the pillow and lesser pressure exertion upon their physical joints. This had relieved them from their joint aches and provided perfect contouring to their sleeping positions and movements. One of my colleagues found an older model of this product which proved to be more successful in providing large cooling effect in comparison to the latest model. My colleague stated that the cooling gel side of the new model is difficult to sleep on due to the extensive gaps which are void of the cooling gel. In overall, we advise using the memory pillow side in order to experience a cozy and comfy sleep as the pillow is also successful at protecting its users from the warmth. 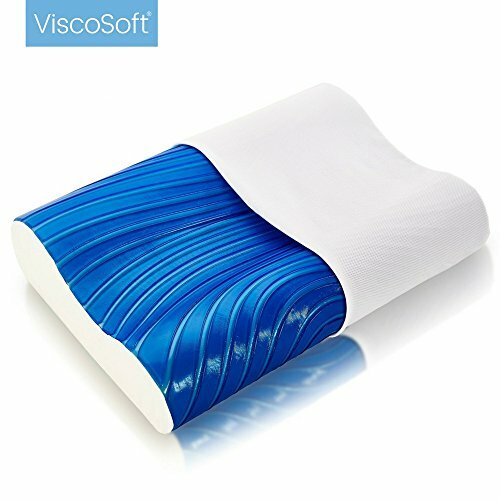 The cooling gel pillows from ViscoSoft are famous for their unique Arctic design that ensures its users a satisfying sleeping experience. The Arctic design delivers a cool, soothing sensation, especially in warm surroundings. The design also accommodates supremely to provide professional and therapeutic support. ViscoSoft Arctic cooling gel pillows have been known to provide greater intensities of cooling in comparison to its competitive brands. This is because they contain 30% greater cooling gel and a specialized molded foam that keeps the cooling effect intact within its foam surface contrary to the traditional memory foams. The WaveFlow Gel Technology uses the high thermal conductivity to dissolve the heat over the gel layer. Apart from greater cooling, you can rely on the individual custom adjustment of the memory pillow to contour and support your neck and shoulders. The amount of support provided is equivalent to therapeutic treatments as the support from the product tends to relax the muscles and joints of the body that are usually vulnerable to being strained from unconventional styles of sleeping. Moreover, this eliminates any risk of you suffering from spinal misalignment. A majority of the customers who bought the ViscoSoft Artic Gel Pillow including my colleagues and me favored this product for the intense cooling it provided in comparison to other brands within the same category. We believe that the product provides the intense cooling as expected from a genuinely cooling gel pillow. Apart from the admirable high cooling effect, many of us noticed an easiness of muscles and joints and to some extent, even pain relief from the use of this product. A colleague of mine was previously suffering from neck pain when sleeping with ordinary pillows after having a neck surgery due to a car accident. You would be delighted to hear that after using this product, my colleague reported having decreased neck pain and appeared to be happy about enjoying long restful sleep regularly with this product. Even those of us without any physical pain have expressed feeling no discomfort at all while sleeping in contrary to our previous experiences with other products. Most of us did not experience any repulsive smell at first from opening the product from its package, however, few of those who did, had mentioned that drying the pillow out under the sun with the free flowing air had made the slight smell disappear after 1 or 2 days.